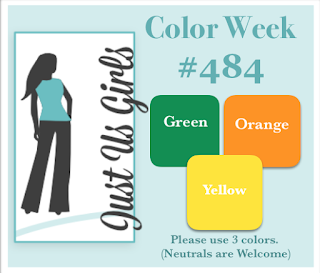 It's Color Week at Just Us Girls and Maria has chosen a fresh color combo for us to create with. 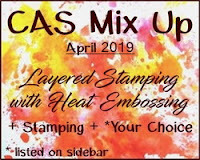 Hop on over to JUGS to see what Christine Perez, our April Guest Designer and the rest of the Design Team have created with this awesome color combo. Using the Concord & 9th set Pop Art Pineapple. Stamped the pineapple in Versamark and heat embossed with yellow ep, then stamped the polka dot layer on top of that with Versamark and heat embossed with copper glitter ep. Stamped the stem and heat embossed with lime green ep on some Gina K Charcoal Brown cardstock. Stamped the banner from the same set onto some orange and stamped the sentiment and heat embossed with the same yellow ep and fussy cut the banner. 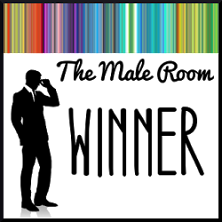 Now it's your turn to show us what you can do with this color combo. You could be chosen as our next Chic of the Week, which would then make you eligible at a chance to become our next Guest Designer. Please limit your entries to 3. 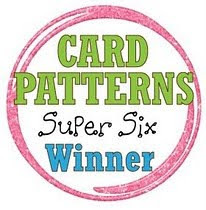 Layered stamping with heat embossing, stamped the banner and sentiment, die cutting the layers. 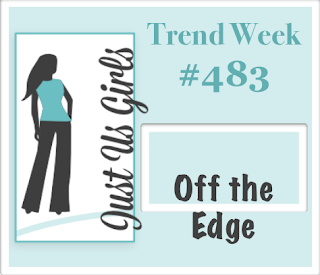 It's time for Trend Week at Just Us Girls and Angie has chosen a fun trend for us to try - Off the Edge.. 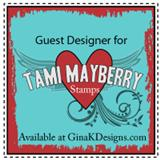 Joining us again this week as our Guest Designer is Christine Perez! Hop on over to JUGS to see what Christine and the rest of the fabulous Design Team have created by going off the edge. Stamped the big bloom from Stampendous onto watercolor paper, stamping off the edge on the left with Versamark and heat embossed with gold ep. Used Inktense pencils to watercolor the petals and added a few splatters. After it was dry, trimmed the right edge and fussy cut around the petals to go off the edge as well. Matted with some very old SU Vintage Violet and onto a lighter purple card base. Join us at Just Us Girls and show us your Off the Edge creations and you could be chosen as our next Chic of the Week, which would then make you eligible at a chance to become our next Guest Designer! Please limit your entries to 3. 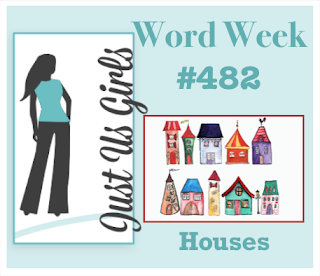 It's time for Word Week at Just Us Girls and Bobby has chosen the word Houses! Since this is the first Saturday of April, that means it's time for a new Guest Deisgner! Welcome Christine Perez! Come check out what Christine and and all of the JUGS Design Team have created with houses. I was very limited when it came to houses so I went with this Studio G mushroom house. Stamped the mushrooms with Touch Twin markers and then framed with a Gina K frame stamped in black and die cut with the coordinating Spellbinders die. Added a couple mushrooms from various stamp sets to the frame edge and the sentiment from Gina K.
Come play along with us and you could be chosen as our next Chic of the Week, which would then put you in the running at a chance to become our next Guest Designer! Please limit your entries to 3. 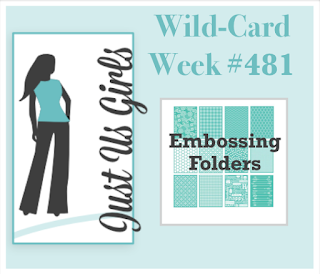 This month has a fifth week, so it's Wild Card Week at Just Us Girls! I'm the hostess for this challenge and I want everyone to dig out their embossing folders! I have so many embossing folders and hardly ever use them, so it's time to show them some love. Since this is the last week of the month, it's our last week with our Guest Designer Greta Hess! Thank you Greta for joining us this past month with all of your fabulous creations! Check out the JUGS Blog to see how Greta and the rest of the Design Team have used embossing folders on their creations. I used a Tim Holtz brick ef with Core'dinations White Wash cardstock, sanding the bricks after embossing to reveal the kraft core. Stamped some leaves across the top and added some Altenew poppies and the Reverse Confetti sentiment banner. The minister's wife at our church has asked everyone to decorate one cross for use on the bulletin board and here is one of the 6 I have done. This was embossed with a lattice folder and sponged with Golden Glitz ink. 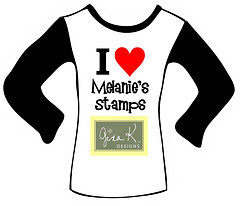 Added the sentiment from Gina K and the leaf die cuts. Now it's your turn to share your embossing folder creations with us. You could be chosen as our next Chic of the Week, which would then make you eligible at a chance to become our next Guest Designer! Please limit your entries to 3. 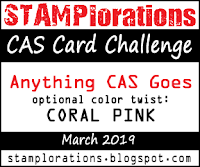 Another entry for the March Stamplorations CAS Card Challenge - Anything Goes with the optional twist of Coral Pink. 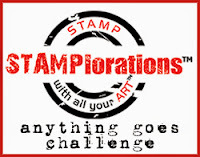 and the Stamplorations Never-ending Anything Goes Challenge. Stamped and colored the cupcake and decided to add some Stickles in punch to the frosting and yellow to the candle flame. Die cut the oval and layered onto some white polka dotted coral patterned paper from my stash. Stamped the sentiment in coral ink, punched it out with a word window punch and layered onto a banner die. 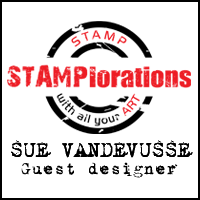 I recently got some new stamps from Stamplorations and found some time to play with them for the March Stamplorations CAS Card Challenge - Anything Goes with the optional twist of Coral Pink. Stenciled the Stamplorations Hearts All Over stencil with coral ink onto some woodgrain patterned paper from my stash then while the stencil was still in place sprayed lightly with some coral shimmer mist. Stamped the sentiment, also from Stamplorations with coral ink onto some kraft. Die cut the sentiment with a heart die and sponged some brown ink around the edge of the heart. Die cut the Clustered Hearts Die from coral cardstock and used a couple of the negative hearts and sprayed them with the coral shimmer mist as well. Also adding this to the Stamplorations Never-ending Anything Goes Challenge. 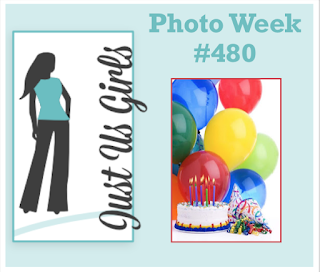 It's Photo Week at Just Us Girls and Maria has chosen a fun, colorful photo for our inspiration. Come visit the JUGS Blog to see how our Guest Designer - Greta Hess and the rest of the JUGS Design Team were inspired by this fun photo. I followed this tutorial by Jennifer McGuire to create this fun pop up card. I used various company's stamps to make this birthday card. Show us your creations with the Photo as your inspiration and you could be chosen as our Chic of the Week, which would put you in the running at a chance to become our next Guest Designer! Please limit your entries to 3. I am a working mother of 2 grown children and Mimi to 5 adorable grandsons. My daughter got me into stamping in 2005 and I have been hooked ever since.